Tri-fold loading ramps have a lot of good points---first, they give you plenty of loading width, but still fold compactly enough to slide between the wheels of most ATVs and UTVs. Then, Great Days Load-Lite Tri-fold Ramps add a few things that you wont find with the other guys. They are made of lightweight aircraft aluminum, they have gripping ridges on the loading rungs for sure-footed loading, quick attaching security straps for safe loading and the lightest weight of any tri-fold ramp on the market. Weight: 22 lbs., Capacity: 1250 lbs. 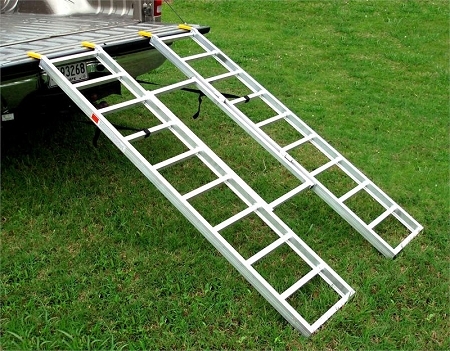 Heres a tri-fold ramp that offers both extra length and rung spacing to handle loading either ATVs or lawnmowers. With the open center section, the extra length provides for safe, less inclined loading.